Roller-Compacted Concrete pavements were first used in the 1970’s for stabilization of logging roads in the US and Canada. It has proven to be a very effective heavy duty pavement that can stand up to harsh climates, heavy wheel loads and difficult operating conditions. Typically, Roller-Compacted Concrete has been used for heavy duty pavements such as log handling yards, intermodal terminals, freight depots, and other industrial applications. However, more recently there has been an increase in the use of Roller-Compacted Concrete to create cost-effective pavements for many conventional highway and street applications. 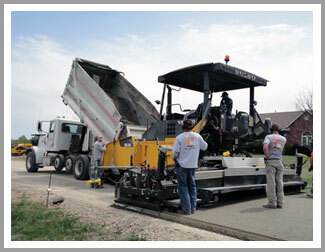 Much of the information for this site is from the Guide for Roller-Compacted Concrete Pavements, published by the National Concrete Pavement Technology Center. The guide is considered by many to be the most comprehensive resource for Roller Compacted Concrete pavement. It is highly recommended that designers and specifiers who are interested in utilizing Roller Compacted Concrete pavements should refer to the guide for all aspects of specifying, designing and constructing Roller Compacted Concrete. The Guide for Roller-Compacted Concrete Pavements is available for purchase through the National Concrete Pavement Technology Center and the Portland Cement Association. Click here for more information.